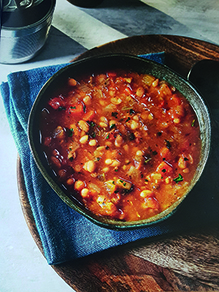 This Slimming World dish is perfect for warming up all the family on cold nights. Easy to make, it’s just the recipe you need for Bonfire night! Spray a large non-stick saucepan with low-calorie cooking spray and place over a low heat. Add the frozen vegetables, dried herbs, 3 tbsp water and a little seasoning. Cover and cook for ten minutes, or until soft. Add the stock and baked beans and bring to a simmer, then cover again and cook for 15 minutes. Remove from the heat and leave to cool slightly. Ladle half of the soup into a food processor or liquidiser, blend until smooth and stir back into the pan. Bring back to a gently simmer, stir in the Tabasco and sprinkle with the parsley to serve. Mix the lemon juice, rocket, chilli, pine nuts and 1 tbsp oil. Scatter half over the tart and serve the rest on the side. Fancy adding meat to the dish? Cook 4-6 Slimming World Syn-free pork sausages according to the pack instructions, slice thinly and add them for the last five minutes of the cooking time.